Water for drinking and domestic use may be obtained from natural sources like surface water, groundwater and rainwater. The surface run off contributes turbidity, organic matter and pathogenic organisms. Usually in surface water bodies, the dissolved mineral particles will remain unchanged while the organic impurities are degraded by chemical and microbial action. In slow-flowing or impounded surface waters sedimentation of suspended solids occurs naturally. Due to the lack of nutrients micro-organisms wil1 die off. 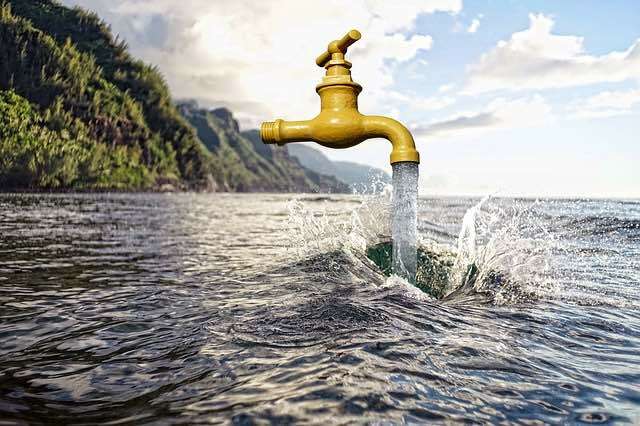 Although clear water from rivers and lakes requires no treatment, on taking into account the risk of incidental contamination, it is better to practice chlorination. Unpolluted surface water of low turbidity may be purified by slow sand filtration alone. Alternatively, rapid sand filtration followed by chlorination can be practiced. Wells and springs constitute groundwater supplies. Groundwater mostly originates from infiltrated rainwater which after reaching the aquifer flows through the underground. Groundwater provides water to meet the requirements of individual household supplies as well as municipal supplies. The treatment processes also differ in these two cases with simply boiling the water before use for household supplies. However, municipal supplies require one or more treatment processes depending upon the impurities found in the water. A little contamination of groundwater occurs from organic and inorganic soil particles, animal and plant debris, fertilizers, pesticides, microorganisms, etc. as it flows through the soil layers. In spite of this contamination, infiltration causes partial removal of suspended particles including microorganisms. Organic substances are also degraded by oxidation. Partial removal of microorganisms occurs by the death of cells due to lack of nutrients. Thus, properly withdrawn groundwater will be free from turbidity and pathogenic microorganisms. It is important to select the location of groundwater supply at a safe distance from other sources of contamination.. If done so, groundwater will be of high quality and can be used directly without any treatment. Rainwater runoff from roofs can be collected and stored for domestic use. Rainwater will be of high quality and the only possible source of contamination is airborne microorganisms that too will be present in very low numbers. Typically located in the headwaters of river systems, upland reservoirs are usually sited above any human habitation and may be surrounded by a protective zone to restrict the opportunities for contamination. Bacteria and pathogen levels are usually low, but some bacteria, protozoa or algae will be present. Where uplands are forested or peaty, humic acid can color the water. Many upland sources have low PH which requires adjustment. Low land surface waters will have a significant bacterial load and may also contain algae, suspended solids and a variety of dissolved constituents.